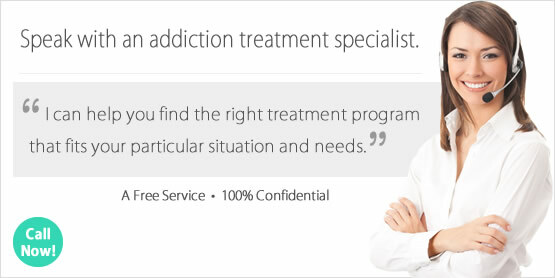 Looking for a Drug Rehab or Alcohol Treatment Program in California? Individuals who have given up trying to get help for a drug or alcohol problem in California may just need better answers. Not every drug treatment program is going to provide the best results for all clients, and there are programs which are more effective than others with higher success rates at treating those who have more extensive addictions issues. So when failures happen, it is often times because the person just wasn't given the very best chance to begin with. When a proper assessment is done by treatment professionals and the most highly recommended drug rehab on an individual basis is accessible the best results can be achieved. So speak with a drug treatment counselor in California to find out what the best option for your or someone you care about is today. In a single-day count in 2013, 117,159 individuals were enrolled in some type of substance use treatment in California. Among individuals in California enrolled in substance use treatment that year, nearly 42% were in treatment for drug use only, nearly 17% were in treatment for alcohol use only, and nearly 42% were in treatment for both drug and alcohol use. When looking into which illicit drugs were significant problems among treatment admissions in the state, amphetamines and heroin stand out. Amphetamines are a category of drug that would include the highly addictive street drugs methamphetamine, crystal meth, and the like. When you include 'other opiates', which would be prescription pain killers, opiates in general and amphetamines are abused at the exact same rates among treatment admissions. Both addictions, amphetamine and opiate, are extremely troublesome and difficult to overcome in even the very best circumstances with very high relapse rates. So California drug treatment programs have their work cut out for them. Nearly 950,000 California residents aged 12 and older report that they are dependent on or abuse alcohol, a rate that has not changed significantly over the past several years. Sadly, only 8% of these individuals received treatment for this problem last year. The number of individuals receiving help for both and alcohol abuse in the state has been steadily declining in fact, so the problem is getting worse not better. One of the problems with alcohol treatment in California is the idea that there is only one approach that is going to work. Just because traditional treatment models have been around for a long time and are well-accepted in California, such as 12-step, doesn't mean they have the highest success rates. 12-step programs in general and AA actually have very low rates of success for example, a mere 10% at best in many cases. Alcohol treatment in California must be aggressive enough to match the aggressiveness of the problem, and the highest success rates can be seen in programs which provide an integrated approach to treatment and the most appropriate environment to suit their client's level of dependence. There are around 1550 drug treatment programs in the state of California, over 1,100 of which are outpatient treatment programs. Nearly 1,000 of the outpatient programs in the state deliver the very minimal amount of treatment that could be delivered in such circumstances, and provide counseling and therapy to clients anywhere from 1 day a week to every day depending on what type of program the client is involved in. Intensive outpatient is usually more intensive than regular outpatient services, and some facilities deliver both. There are also over 250 facilities in California which provide day treatment/partial hospitalization, which is an everyday commitment for most and also makes additional services available to them which wouldn't be available in another outpatient setting, such as dual diagnosis treatment for individuals with a co-occurring mental health disorder. It should come as no surprise, due to the apparent opiate addiction which is at epidemic proportions in the state, that there are at least 150 outpatient programs in the state providing opiate maintenance services. These facilities administer prescription drugs such as methadone and buprenorphine to clients who are opiate dependent, and there are nearly 29,000 outpatient clients participating in opiate maintenance services in California at this time. Opiate maintenance services are very different from traditional treatment services, because individuals won't typically be taking part in other treatment aside from receiving the medicine that they are given daily to stop their drug seeking behavior. It is only effective in curbing cravings and stopping harsh withdrawal syndrome, it doesn't effectively cure opiate dependence. However, there are 46 hospital inpatient facilities in the state and there are also around 560 residential non-hospital programs which deliver either short-term 30-day treatment or long term treatment for more serious cases. The most obvious difference between outpatient and these options is the individual will remain in the inpatient or residential facility, which is drug and alcohol free, which in itself eliminates the risk of relapse while undergoing treatment. It also provides an environment which is more conducive to effective treatment, because individuals don't have anything distracting them from their treatment whether it is work and family obligations or perhaps drug using influences. So needless to say, these programs generally speaking have far higher success rates than outpatient programs in California, particularly those which provide the most comprehensive and extensive treatment plans. What does Inpatient Rehab in California Involve? There are anywhere from 15-16,000 treatment clients participating in hospital inpatient and residential non-hospital drug rehab facilities in California each year. This is in stark contrast to the numbers for outpatient programs which handle over 100,000 clients annually. Inpatient and residential treatment requires more of a commitment which can make it difficult for some clients who have obligations they genuinely cannot take a break from to receive treatment. But for most, taking a break from their normal everyday life is exactly what will help them truly overcome their drug or alcohol addiction. In a short term inpatient or residential program in California, clients can expect to become involved in a treatment process that obligates them to participate in either a short term 30-day program or a long term treatment plan of 60 days or more. program. Many years or research and studies of long term outcomes have proven that success rates for treatment clients are directly commensurate to the time and effort they put into it. Some programs are more vigorous than others, and some have a more effective approach but don't take as long. If someone speaks with a treatment counselor to determine which inpatient or residential program is right for them, they can find the right match. What does Outpatient Rehab in California Involve? How much is involved in outpatient treatment in California really all depends on which program you are participating in. If the outpatient program primarily focuses treatment around meetings, group counseling, focus groups, etc. then you can anticipate slower results than a program where you are more involved in activities tailored for you and your circumstances in particular. There are outpatient treatment programs in California which offer more individualized treatment, and other services which are more personalized to you such a behavioral modification and motivational therapy. Outpatient treatment is again a very minimalistic approach, and is not aggressive enough in most cases when someone has struggled with a chronic drug or alcohol problem and who hasn't responded well to outpatient treatment in the past. For example, someone who has taken part in outpatient treatment before but relapsed won't typically do any better the second or third time, and an inpatient or residential treatment program would be far more ideal. 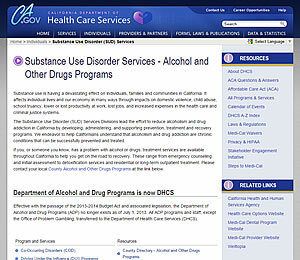 California Department of Health Care Services (DHCS) provides Californians with access to affordable, high-quality health care, including medical, dental, mental health, substance use disorder services, and long-term services and supports. 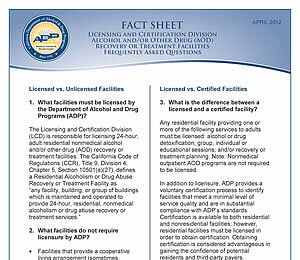 Frequently asked questions about Licensed vs. Certified vs. Unlicensed alcohol and/or other Drug Recovery or Treatment Facilities. 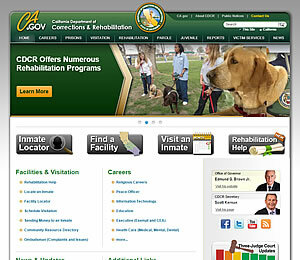 California Department of Corrections & Rehabilitation offers numerous rehabilitative programs and services provided to both prison inmates and parolees. 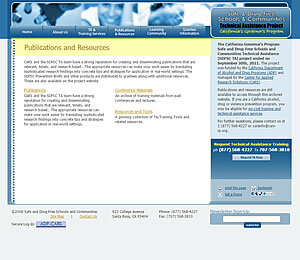 This website also offers an Inmate Locator and Facility Locator. 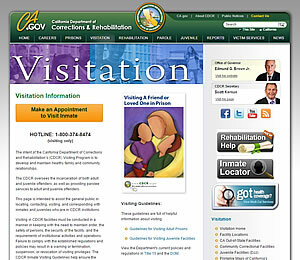 CDCR inmate visitation page is intended to assist the general public in locating, contacting, visiting, and corresponding with inmates and juveniles who are in CDCR institutions. The California Governor's Safe & Drug-Free Schools & Communities Project works to promote alcohol, drug, and violence prevention in Schools and communities. 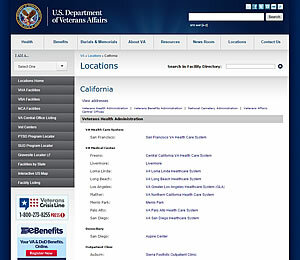 US Department of Veterans Affairs (VA) California Locations for VA Central Offices, Medical Centers, and Outpatient Clinics.